with ・・・ Next show will start soon!! . 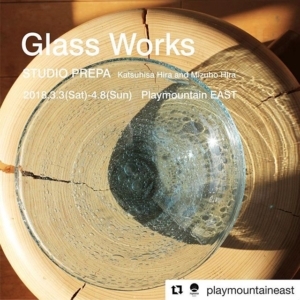 GLASS WORKS STUDIO PREPA -Katsuhisa Hira and Mizuho Hira- 2018.3.3(Sat) – 4.8(Sun) . Opening Reception: 3.2(Fri) 6:00pm-8:00pm *please make RVSP from link in bio!!! . Studio Prepa is a glass blowing studio runs by Katsuhisa and Mizuho Hira. From vases to sculptures, their creations reveal detail oriented sensibilities. They create each one through blowing glass, traditional glassmaking technique, allowing for a wide variety of designs. They enjoy creating their idea to the challenging construction of the molten material. Their approach combines commitment to quality with an emphasis on sophisticated designs so their work remains simple and functional yet some of their designs are dynamic and bold. For this show at Playmountain EAST, they are showing diverse collection including collaboration work with Playmountain. .